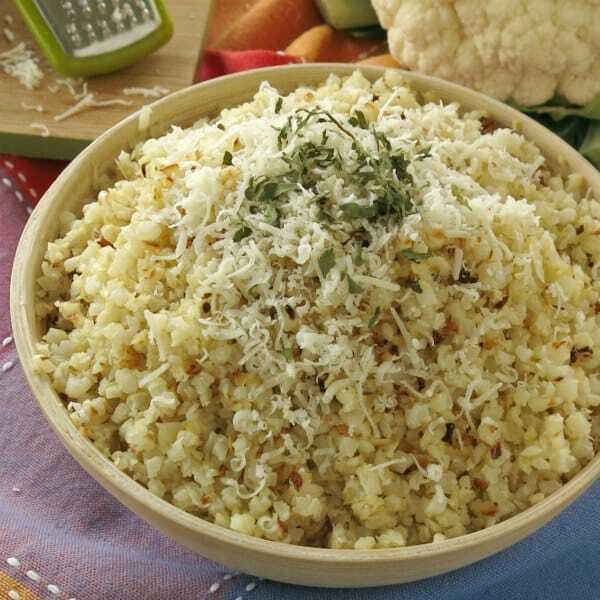 Make Roasted Cauliflower Rice with Parmesan cheese and garlic with a package of cauli-rice from the FROZEN food aisle or with a freshly prepared batch. Either way, it’s an easy side dish everyone will love! The first (and second) time I made this recipe, I sat down and devoured the entire bowl. Who does that…unless it’s absolutely delicious…and low-carb and gluten-free?! I rave about all my cauliflower recipes because they’re like children and I truly enjoy them all. From cauliflower muffins to cauliflower grits, this vegetable is a staple at our house. But, roasted cauliflower rice that has been tossed with olive oil and garlic and toasted in the oven until it’s a little browned is hands down my favorite child…I mean recipe. The texture is light, fluffy with a bit of nuttiness all at the same time! Each bite melts in your mouth. Top it with powdery Parmesan cheese to create a side that will complement everything from Gourmet Meatloaf Muffins to Lemon Pepper Tilapia. No matter what the diet, you’ll pick this healthy side dish over rice every single time. That’s just how delicious it is. 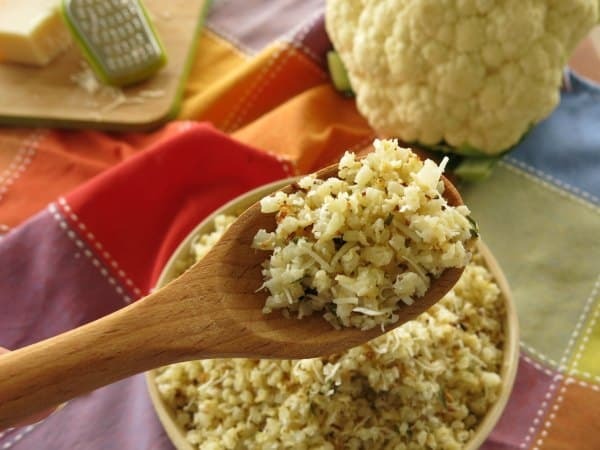 Cauliflower rice – make it from scratch. Or, take the easy route and buy a fully prepared bag from the freezer section of the grocery store. 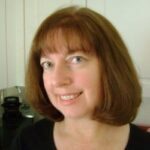 Garlic cloves – use a garlic press or knife to finely chop it. 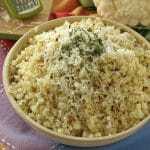 Parmesan cheese – use the option that works for your diet, such as a vegan or vegetarian alternative. My daughter makes up this Vegan Parmesan Cheese by Vegan in the Freezer. Four cups of riced cauliflower will serve 4 people. You’ll end up with about 3 cups cooked. As mentioned previously, that can go pretty quickly (ahem!!!) To double the recipe, use 2 sheet pans so the rice is not crowded which is rule number 1 of perfectly roasting vegetables! Wash and thoroughly dry a head of cauliflower. Cut the florets from the stalk. Add them to a food processor and pulse several times or until the cauliflower resembles rice. 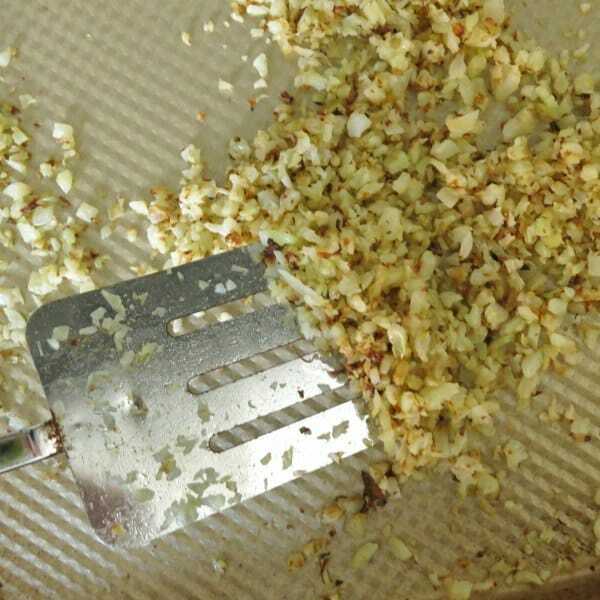 A box grater can be used instead of a food processor too. There are few more process pictures in the recipe for Curried Cauliflower Rice plus another plug for making extra bags to freeze. 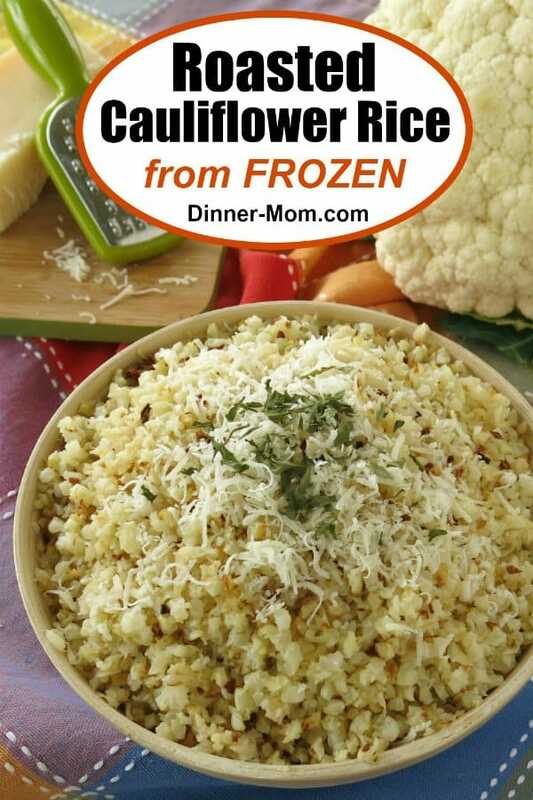 We LOVE the convenience of using frozen cauliflower rice to make this recipe and it doesn’t take away from the taste at all! Whether using a bag of rice you’ve prepared yourself or using a bag from the store, the only thing you need to do is break up any clumps. I’ve been able to easily do this with my hands, breaking it up with a fork or hitting the closed bag on the counter. Do NOT defrost the cauliflower rice first. However, if you are unable to break apart a large clump, then zap it in the microwave for a few seconds. 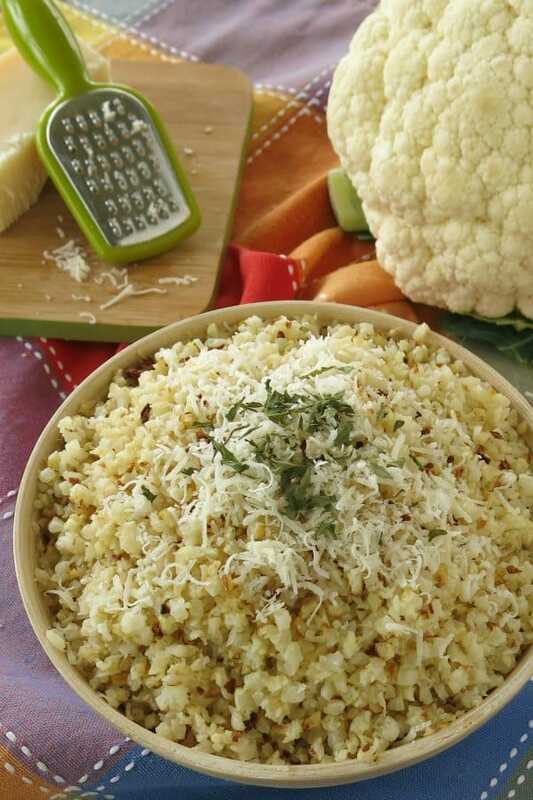 Roasting cauliflower rice works much like the process used for roasting any type of vegetable. Spray a large sheet pan with non-stick cooking spray. This helps with browning as well as sticking. Roast the cauliflower rice in a 400°F oven for 10 minutes and then turn the rice using a spatula or large spoon. Spread it out on the pan again. It won’t be brown at this point. Don’t worry! Continue roasting for 10-15 more minutes. Frozen cauliflower rice will likely take the full 15 minutes. Take a peek to make sure it’s browned to your liking. It won’t be brown all over. Instead, there will be some browned pieces and some that are just a little brown. Scrape all of those delicious brown bits into the bowl with the roasted cauliflower rice. Finish it off with Parmesan cheese and enjoy. We added a little dried parsley for the picture. We made this batch using a bag of frozen cauli-rice from the grocery store! No fuss-no muss! If using frozen cauliflower, break up any frozen clumps, but do NOT defrost. Mound cauliflower rice in the center of a sheet pan coated with non-stick cooking spray. Spread cauliflower rice into an even layer on the sheet pan. Roast cauliflower rice in the oven for about 20 minutes, turning the rice half-way through with a spatula or large spoon. If cooking from frozen, it will take about 25 minutes. Remove cauliflower rice from oven to serving bowl, scraping up all the browned bits on the pan. Frozen Cauliflower Rice Recipes that start with a bag from the Freezer Section of the grocery store. I made this with dinner last night and it was a total hit! You would never know it was made with veggies!